New images of Jupiter from Juno will absolutely blow your mind. NASA’s Juno spacecraft is finally starting to return images of Jupiter after entering orbit back in July, and they are pretty incredible. Juno obtained the data last weekend as it made its closest approach to Jupiter on its highly elliptical orbit, and the images show the swirling clouds at each of its planet in the highest detail we have ever seen. 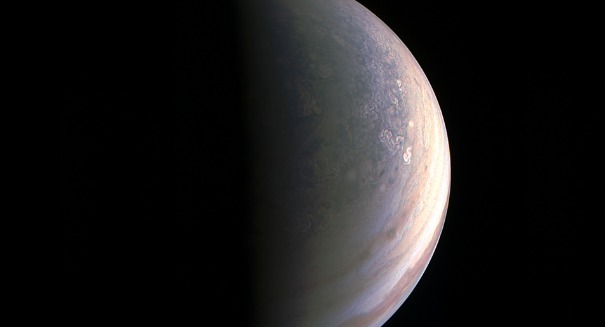 Juno snapped the photos while just 4,200 kilometers from the cloud tops of the gas giant. A total of 6 megabytes of data have been downlinked to Earth, and scientists are analyzing it. But just from their first glimpse of Jupiter’s north pole, scientists can see that it’s like nothing they expected — it’s much more blue than other parts of the planet and there are a lot of storms. It doesn’t have those trademark bands of storms like the rest of the planet. Scientists will use the spacecraft’s special instruments to examine the layers of the gas giant and better understand its composition, temperature, motion and other aspects.